Apples of Gold Jewelry offers a beautiful new stud earring that will sweep you off your feet with these scrollwork emerald stud earrings in 14K white gold! Lovely 4mm round cut emeralds are the main focal point on each earring, held in place by a beautiful 14K white gold earring with a feminine scrollwork design. The deep, vibrant green emerald stones, which are authentic, are A rated. The earrings also feature friction push back post closures, which are easy to use and ideal for keeping your earrings on safely during special events or every day wear. 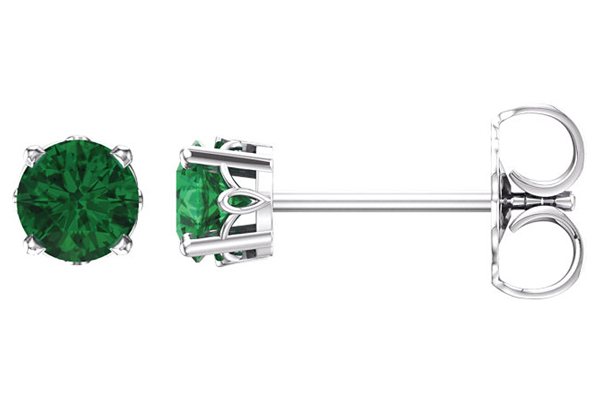 We guarantee our Scrollwork Emerald Stud Earrings, 14K White Gold to be high quality, authentic jewelry, as described above.